I am so excited to bring to you this range of professional prints and unique products. I have spent hours searching for the perfect items that are quality, unique and just make my heart sing. I hope you love them as much as I do. *Prices are subject to change at any time. Prints, Frames, Canvas, Walldots & Woodblocks are 100% Australian made. Albums are sourced from Italy and USA. Create a stunning gallery anywhere in your home with these fantastic fabric wall dots. Affordable, Australian made, eco friendly and high quality fabric. Just peel and stick, no framing or hanging. They are also removable so you can move them from spot to spot. 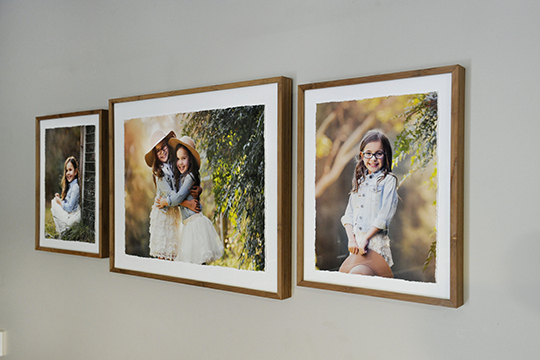 Floating InFinity Frames feature gorgeous Bamboo mouldings with hand torn photos printed on Hahnemuhle Photo Rag paper, mounted behind UV resistant and lightweight acrylic. Floating InFinity Frames can hang on a wall individually or as a collecton. Each Floating InFinity wall frame includes the revolutionary "The Ledge" hanging system. Each Ledge hanging piece includes a small spirit level to ensure your frames are hung straight, each and every time and they make hanging and aligning collections really easy. Available in Rectangle or Square with round print. Wood Blocks are handmade photo blocks, beautifully crafted with a rustic and organic finish. Your images are mounted and sealed onto 19mm wooden blocks. The surface of the image is sealed to protect it from moisture and UV damage. The edges are hand sanded, and you can see a small amount of the wood peeking though the corners with soft brush strokes visible on the surface. They can hang, stand alone or look super cute on a little easel. Pictured is the Alice Collection. All blocks are available individually. Metal Prints are incredibly stunning photographic printing of your image directly onto metal. These prints have brilliant luminance and vibrant depth of colour. Inks are heat infused into the specially coated aluminium ensuring a durable and scratch resistant surface. A truly showstopping product of archival quality. These Boutique Baby Books are cute and a timeless way to keep your professional photos in a beautiful 20 page, 8x8" book with lay flat pages presented in a matching keepsake box. Available in a range of colours, these are a simple but classic way to have your photographs displayed. If you love the idea of a coffee table book, but don't have a coffee table or are worried about potential spillages, then this one is for you! A Looking Glass Album is a 20 page book bound in leatherette, then framed in a matching leatherette box with a perspex cover that is removable by magnets to hold, protect and allow you to display your keepsake, other than on the coffee table. Place me on your hall stand, bedside table or display shelf to admire everyday, and your Looking Glass Album will be easily accessible to show to family and friends. Family Albums currently being updated due to change in supplier. Quality varies between print labs. Each supplier I use is colour calibrated to my work. Their printers speak the same colour language as my computer screen so you can be assured that what you receive is printed exactly as I intended when creating your artwork. 100% colour correct images every time! I don't mind if you have your images printed elsewhere. The important thing is to have them printed and displayed in your home where you can enjoy them. I do warn however, that I will not guarantee the colour correctness of prints not ordered through me. If you are going to print larger wall art please consider ordering at least the print through me to be sure it is a beautiful quality, colour correct, detailed print.